With the much-awaited long weekend just round the corner, UAE residents are all busy chalking out plans to spend the holidays wisely. While most of them already have travel plans in place, there are others who prefer to stay in the city and engage in some fun activities. So, if you are not heading out of UAE, you might want to consider the plethora of places that you can visit and things you can indulge in while being in the country. IMG Worlds of Adventure has launched National Day promotions for the entire family. 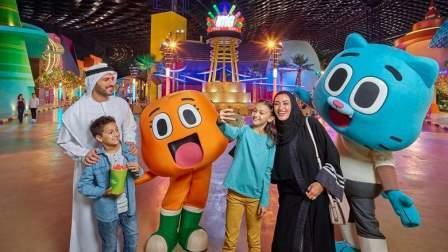 Effective from November 30 to December 3, tickets to the indoor theme park will be available in-park and online with a savings of Dh46 each on both adult and junior ticket prices. The guests will be treated to traditional Emirati music and entertainment, which includes Ayylah dancers - an Emirati traditional band, falcon displays, and Arabic specialty sweets and beverages. To celebrate the National Day and its core ethos, Ferrari World Abu Dhabi and Yas Waterworld have invited all residents with a valid Emirates ID to celebrate the occasion like never before. On every bronze pass worth Dh275 purchased at Ferrari World Abu Dhabi, you get complimentary access to Yas Waterworld for a one-of-its-kind celebration (or vice-versa). In this great time of the year, Ferrari World Abu Dhabi and Yas Waterworld invite all the residents to join hands together and celebrate the power of the UAE Tricolour! To know more about the UAE National Day residents offer, you can visit them on the Yas Waterworld and Ferrari World Abu Dhabi websites. Dubai Parks and Resorts, the region's largest theme park destination, has also announced its National Day offers. You will get an amazing 'Double the Fun' promotion where you can enjoy 'two days for the price of one' over this special weekend at Motiongate Dubai, Bollywood Parks, Legoland Dubai and Legoland Water Park. Effective from November 30, UAE residents will be able to take advantage of the rates of Dh165 for a day ticket to Motiongate Dubai, Legoland Dubai and Legoland Water Park and Bollywood Parks Dubai. You can book your tickets online at www.dubaiparksandresorts.com. Tickets will also be available at the park gates. La Perle, the region's first resident theatre show, is offering guests 46 per cent off tickets over the National Day weekend. The promotion is valid on all bronze, silver and gold tickets purchased for any performances between November 29 and December 3. That would make the bronze tickets - which are normally priced at Dh400 - Dh216 over the three days. Dates: November 30 to Deccember 3. On display at the mall's Souk Atrium as part of the National Day celebration, the 'moon' is a touring artwork by Bristol-based installation artist Luke Jerram. He created a replica of the moon using highly detailed imagery from the National Aeronautics and Space Administration (Nasa) and called it Museum of the Moon. Over 40,000 people are expected to attend the three-day extravaganza at the Happiness Market at Zabeel Park. There would be a wide variety of street food and shopping choices, including clothing, accessories, jewellery, gifts, books and toys, available in an ambiance of fun and togetherness.There are games and activities for kids, making a visit to the market a holistic family experience. Get down to City Walk in Jumeirah to join in the celebrations for the National Day. There will be entertainment and activities for the whole family, including a parade that's set to feature over 1,200 performers from 16 different countries. City Walk will also host a Grand Parade. There will be performances on stage, as well as live painters, a Heritage Village, and activities for the kids. The gardens of St Regis Dubai will be transformed into a winter wonderland for the festive season, as the hotel hosts a holiday-themed Winter Garden Market. The market will be full of yuletide decorations, carol singers, and more, with fun for the whole family. Stalls will be set up and they'll be selling everything from gifts to seasonal food. In celebration of the National Day, this exhibition 'emARTi 46' - Spirit of the Union - bring together 46 Emirati artists from all the seven Emirates aimed to promote Emirati tradition, heritage and spirit. The exhibition features 46 masters and young Emirati artists. To demonstrate the unity and diversity that the many nationalities, culture and traditions represent in this great nation, the Arabian Center alongside 20,000 residents will be seen creating beautifully handcrafted origami paper pegs. Each paper peg made by different nationalities will be intertwined seamlessly symbolizing unity among residents, to form the National Flag. Working hand-in-hand with the residents, the mall will attempt to display the completed flag during National Day holidays in the night court of the mall. The Ministry of Culture and Knowledge Development has unveiled its programme of cultural and national events organized on account of National Day celebrations. Various segments of the UAE society are invited to participate in the events across the country to express their pride in the nation's cultural, civilizational and humanitarian heritage, in addition to its globally highlighted achievements. This year's events include performances by folk bands from 30 countries, heritage villages, art exhibitions, murals, in addition to art and cultural activities. Cultural centers will additionally organize more than 100 various activities ranging from carnivals, murals, art, theatre and folk performances, competitions, crafts workshops and book fairs. Dubai Festival City, Wafi Mall La Mer, Dragon Mart 2. Last Exit will be opening an eerie indoor dining area at Last Exit Mad X, and an airstream called Last Exit Live. It will host weekly performances thereafter, with musicians, DJs, dancers and other performers every Friday from 7pm to 11pm. Selected food trucks will also be offering up to 15 per cent off for cars decorated in national colours across the long weekend. Celebrate the National Day the UAE way at these great eateries across the land. You've got the time, use it wisely! This National Day weekend is the perfect opportunity to go local and we think you can feel the flavour at one place, Bait Maryam. A Levantine home-style, family-run kitchen, Bait Maryam in Cluster D, Jumeirah Lakes Towers is everyone's grandma's house. By that we mean, it doesn't matter from where you hail; the décor, the welcome and the soulful recipes cooked with love and affection will resonate and remind you of home. mix of both salty and sweet. Blaze turned it into a milkshake to celebrate the National Day. NAY Lebanese restaurant at Somewhere Hotel, Barsha Heights will be serving Lamb Machboos, a traditional Middle Eastern dish, on December 2. Perfect if you love to go 'bah-rmy' over the holiday. Celebrate the first week of December with the famed local favourite, Mandi- of course with Burger and Lobster's own, creative spin on it: tender juicy Canadian Lobster. Served with a generous helping of Arabian spiced rice and yoghurt dressing, the dish promises to take you on a culinary ride infusing Western and Arabic flavours.